The state government continues to push the East-West motorway (a plan they barely mentioned in the 2010 election campaign) over major public transport projects. And 94% believe the Government should be spending more on public transport. Extra spending on roads was supported by 55% of those surveyed. The survey, taken last month by Sweeney Research, involved 601 respondents in Melbourne and 2000 nationally. A survey of attitudes to transport found that 94 per cent of respondents believed more money should be spent on public transport, while just 68 per cent said the government did not spend enough on roads. This trend was reflected nationally, with an average of 88 per cent of those surveyed calling for more public transport funding, and 73 per cent wanting more spending on road infrastructure. ALMOST two-thirds of Australians believe investment in public transport is more important than investment in roads, a survey has found. In Victoria 63 per cent of people surveyed said investing in public transport was the highest priority, compared with 20 per cent who believed it was most important to invest in roads. Would you prefer the Napthine Government to spend more on public transport or road infrastructure projects, like the East West Link tunnel? 23/7/2013: It’s emerged via a Melbourne Times Weekly article that more RACV members believe enhanced public transport is a better fix for traffic congestion than more roads. In responding to the article, the RACV has revealed that only 38% of their members support the East-West tollway tunnel. 24/8/2013: Voters prefer Metro rail link to be built before east-west tunnel: VOTERS in Victoria’s vital marginal seats overwhelmingly want the Metro rail link to be built before the east-west road tunnel. An exclusive Galaxy Poll for the Herald Sun reveals the $9 billion public transport project is rated as the top transport priority by 63 per cent of voters in Chisholm and La Trobe. Only a quarter of those surveyed backed the east-west road, intended to ease traffic congestion for those driving to the CBD from eastern and southeastern suburbs. 28/11/2013: A poll published by The Age today shows 23% support the East West tunnel, compared to 74% supporting improved public transport. 2/3/2014: Another Age poll: Despite countless hours and millions of dollars spent marketing the $8 billion road project, the latest Age/Nielsen poll has found that only one in four Victorians believe the tunnel should be the highest infrastructure priority to ease congestion and improve liveability. Instead, most people want the government to build the Metro Rail Capacity Project – a nine-kilometre underground train line through the city that would allow another 20,000 passengers to use the network during peak hour. 3/3/2014: Herald Sun/Galaxy Poll reveals airport rail link our top priority: VICTORIANS want a rail line to the airport ahead of a new rail tunnel through inner ­Melbourne or the East West Link, a Herald Sun/Galaxy Poll has found. 18/8/2014: Herald Sun/Galaxy Poll: Today’s poll also delivers a major blow to Dr Napthine’s hopes of a come-from-behind victory with a finding that 62 per cent of voters rate Labor’s signature policy of removing Melbourne’s 50 worst level crossings as more important than the Government’s East West Link project, which is favoured by only 28 per cent. I’m with you Daniel. And I agree with the polls. However, most Melburnians would say it’s great that we can get to the airport from the south-eastern suburbs on a continuous freeway in relatively short time. We can do that because a Coalition government built a big road. The Labor opposition at the time opposed it. Now we have a Coalition government wanting to build another big road and the Labor opposition opposing it. Despite the polls, I think most people want another big road that will/might make their lives easier like the last big road. That’s the spectre that the PT lobby and Opposition has to deal with. Is it the exact same people who then complain about the price of parking at the airport? And who don’t see that there is no reason for the airport to reduce parking prices when it has a captive market thanks to the incessant building of roads to its door? Personally, I would say ‘Support for rail’ is great. Both passenger and freight are important. I always like to see a positive outcome in any event. Here, there can only be so many freeways to be built, then we become all linked, and no more freeways to be built. That means, rail is sure to pick up one day. Sorry Daniel, East West link gets my support. If when we were talking about public transport we were talking about extensions and electrification projects I would agree. But we know that right now, the only transport projects you and the PTUA are preaching are Metro Rail and bloody high capacity signaling. Neither of which have any use and are not needed in this city. We simply dont need Metro Rail, it serves absolutely no new purpose. There are trams to get up Swanston Street. And how can you tell me that we really need trains running at 2 minute intervals? The 6 minute intervals that we have now on some lines are ludicrous. You don’t see people forcing doors onto trains that run at 40 minute intervals because people know the timetables and they get to the stations on time. The abhorrent 10 minute frequencies on some lines on the weekends is hands down one of the worst thing the PTUA has campaigned for. Now, because no one knows the timetables anymore and doesn’t care to find out, nearly every stop you have people “Just turning up” as the train is departing and forcing their way on. Brilliant idea. Not to mention the V/Line trains that have to get to pakenham within 4 minutes, 4 MINUTES! otherwise they lose their path and end up being 25 minutes late. All because of 10 minute frequencies. So no, I do not believe we need any more investment in THIS kind of public transport. You can’t underestimate the silent majority and with cars at about 90% that majority is powerful even if it’s not always very vocal. Also a large part of that 90% (the drivers) can always say they think there should be better public transport because they are not currently using PT presumably because they feel it’s inadequate. But what is the correct balance and subsidy for PT knowing it will never compete with the car in a number of the scenarios. The final question is also loaded because it compares upgrades that could benefit potentially anyone against effectively a single expensive project that the respondent potentially feels will not benefit them. If you asked “do you support road upgrades or public transport projects like a rail tunnel to Doncaster Hill?” you once again effectively compare all potential road projects against a single PT project. The east west link (or east north link in its current form) may not be a public transport project but I also think it needs to be recognised for its potential positive public transport impact. The potential benefits to travel time and reliability on some very busy tram and bus routes would ordinarily be seen as a fairly significant public transport project if it weren’t being achieved via the construction of a motorway. As a compromise, 1 lane of the East-West link should be a busway. Even if the train station carpark is full, people would be able to drive to the station and the car will drive itself back to your house. Big companies may start a driverless bus service to take their workers from the nearest train station to the company office for the 9am start. Currently lots of people drive 50+km a day because the office is 5km from the station and current human driven PT buses go around in a spaghetti fashion. In poor countries, companies already do this. Picking up their workers and dropping them off. Rudd has cut FBT car subsidies, so even more reason for companies to run driverless buses. I don’t disagree with these surveys, but I acknowledge there is a big difference between what someone might say and actually do. Nonetheless, it does raise the question of who does want the East West link? Obviously if the government is so keen on it somebody must want it. This is vital to understand if an effective campaign is to be mounted against the East West link. People talk of the “road lobby” but what is it really? Business, unions, financiers, the RACV, trucking groups have all expressed support for the link as they will personally gain from it. These groups lobby very professionally using appealing language, backed by (perhaps flaky) numbers, with talk of job creation, economic benefit, productivity to support their case. Conversely who is lobbing for PT improvements? The PTUA is opposed to Melbourne Metro. Who is left to support it? From a politicians perspective why would you back a PT project that doesn’t even have support of a supposedly “supportive” lobby group when you have another very appealing road project has is being strongly pushed. Can you imagine the RACV opposing a road project because it didn’t suit some of its members? It just would never happen. Governments are very sensitive to the financial angle of projects. Governments hate operational expenditure as it has to be found year after year. Things like a new bus route, which seems low cost, will require the cash to be found each year in perpetuity. By contrast capital expenditure even if huge, is a one off hit, politicians get some nice media and then the budget goes back to normal. BCR doesn’t really come into the political decision making process as it only quantifies a calculated “dollar value” of benefits. Note these aren’t real dollars, and even a BCR of 1.4 won’t help treasury raises cash to pay for real things like a new school or hospital bed. A project BCR of less than 1 may still provide opportunities for an investor to make real in-the-bank money, which is appealing to government. I think East West link is a giant wake up for Melbourne. A lot of experienced people in the professional transport planning community think the project is a dog. If we are to stop nonsensical projects like EW link, we need to think about how projects are funded, and what makes them appealing to government. We should also think about how some of these techniques could be used to more effectively lobby for PT. A final thought: -Protesting about losing open space, traffic congestion, greenhouse gasses etc. is all well and good, but misguided in my view, as these matters aren’t key to decisions about the project proceeding. Ultimately if government can’t get the financial models to stack up the EW link will be dead. Austin is correct.. 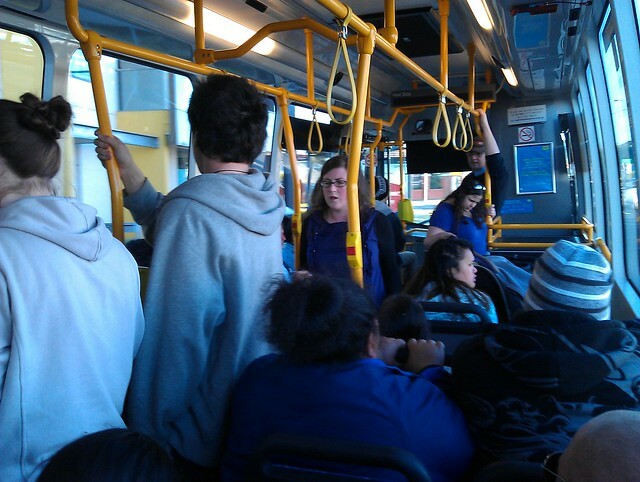 The perception of drivers is that better public transport equals more space on the roads for themselves. If you remember the traffic chaos when the trains when on strike, not long before they became privatised, then you can see their point. They are not the same things. I think what the statistics show is that support for spending on PT is higher that usage of PT, which infers that many people who have cars and drive because they feel they have no other choice are aware that in our big city, governments should be spending on improved PT, not more motorways that’ll get clogged up. I’m going to have to assume that Geoff (comment 4) is trolling, or that in supporting infrequent PT but not frequent (usable) PT, he’s got a somewhat… interesting view of the world. @Jacob, a bus lane in a tunnel on a route which doesn’t go anywhere particularly useful for buses is never going to fly. As for driverless vehicles, yeah there seems to have been some progress recently from the likes of Google, but this has been talked about for decades now. This is spurious. It’s not “either or”. Just as the cyclists often also claim, most adult PT users also have a car. My guess is that the state would struggle to fund more than about $3b itself. Assuming Abbott wins that gives us another $1.5b. Thus private finance of $1.5-3.5b is needed to get the project across the line. Melbourne Metro has similar project cost but due to limited private appetite for rail investment due to lack of cash flow, government (state and federal) have to find all of the money themselves. In effect the ability to privately finance part of the road tunnel makes it “cheaper” by taking the funding off the treasury books. Having said all that, PPP finance ofroads isn’t as appealing as it once was. Back when City link was being set up it was possible to build a road finance it almost totally with private money and make a private investor a nice profit. Now because of increases to construction costs, traffic demand flattening and cost of post GFC finance it’s harder to get it to stack up commercially. That the state is offering to wear the risk of traffic volumes is a sign that market appetite for funding EW link is limited due to the high risk. Transurban not being interested in bidding for the PPP is very interesting. They have probably done their own numbers and found it wanting and think a compensation payout courtesy of their citylink contract is a better deal. It’s a huge concern to me that the state is prepare to take the majority of risk on a project of EW magnitude. This could well make the taxpayer impact of the desal debacle look like chickenfeed. As for future PT projects I think we need a debate about what funding alternatives could be used to level the playing field between road and PT projects. Also consider that PT is disadvantaged by having substantial operating costs that has be found year after year whilst roads have much lower operating costs (mostly relating to maintenance). Is there a way that say Melbourne metro could be structured so that it is as financially appealing to government as EW link? Say could we sell air- rights do developers to part fund it so the road project is no longer “cheaper” . Could we introduce a property levey for areas better served by PT that would benifit from MM? What do we do about federal funding of rail projects requiring the state to loose GST revenue, whilst federal road funding doesn’t cause any loss of the GST grant? How has car FBT rules skewed demand for road away from what would otherwise be the case? What impact would a congestion tax have if all proceeds were invested in PT as occurs in London? If we are to get out of PT constantly struggling to get transport crumbs from the table I think these questions are things to think seriously about. You could just as easily apply a levy on top of Myki fares for new lines. Further allowing commercialization of stations ala the metro model applied to china and hk can make it a viable investment if there are enough stations on the line. Stations should stop being viewed as drop off points and more like community hubs and collection points. The problem is, you have left wing PT idiots and clueless bureaucrats that have no commercial sense. PT is a natural network just like Facebook. However it is simply not producing monetary dividends with idiots in charge.